Acidity on the Sea Bottom May Impair Oyster Growth- the Answer? More Shell. Have a Raw Bar Come to You! This article came in from a shellfish list serve we subscribe to. We have seen Professor Green talk of similar findings in Boston Harbor. Mark Green is waiting out the tide on placid-looking Broad Cove, just north of Portland, Maine. A lab tech and student assistant wait with him. When the tide recedes, they’ll fan out with Green, an oceanographer at St. Joseph’s College in nearby Standish, Maine, across the mudflats and begin taking hundreds of sediment samples at precisely plotted points across the cove. 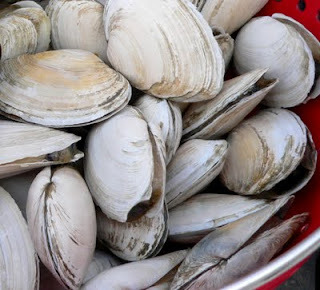 Green hopes that analyzing them will help flesh out what smaller samplings and lab experiments have already told him: that inshore sediments on the Atlantic seaboard are becoming acidic enough to kill the clams and oysters that inhabit them. These samples will also give Green something else: a baseline for testing a simple remedy he’s devised to mitigate this effect and, just maybe, save the East Coast’s beloved shellfish industry . The acidity threat here is a mirror image of the one facing shellfish hatcheries on the Pacific coast. There, acidic seawater wells up from the deep. On the East Coast, the immediate threat comes not from carbon dioxide being absorbed into the seas, but from land, in the form of rich run-off from fertilized lawns, livestock pastures, and sewage overflows. This nutrient bonanza feeds blooms of phytoplankton, tiny floating plants that then die, sink into the mud, and rot in an acidifying exhalation of carbon dioxide. Broad Cove’s water is less than ideal but still alkaline enough for bivalve larvae to survive, but its much more acidic sediment has spelled dissolution and death for young bivalves trying to build their shells. Clam larvae either burrow into this sediment and perish or recoil from it and float around until they’re gobbled by predators. "You could have two to three hundred thousand clams setting per square meter here," Green says, "then come back a soon after and find nothing." These effects on shelled creatures aren’t new; Green first noticed them in 1992, and humans have been fouling inshore waters for far longer than that. But like ocean acidification itself, they had long gone unnoted. Researchers trying to figure out what caused shellfish die-offs focused on pathogens and predators. Green couldn’t convince them that young clams were actually dissolving in acidified sediment until he proved it in the lab. But shellfish gatherers and growers, seeing their yields decline, have long wondered if something was rotten down in the muck. "I suspect that in many areas of the East Coast, we’re seeing the impacts Mark is seeing," says Rhode Island oyster farmer and fisheries professor Bob Rheault, who is also Executive Director of the East Coast Shellfish Growers Association. Rhealt even stumbled on the antidote that Green is proposing for these impacts, though he didn’t realize it at the time. After a big die-off in 1991, he noticed that clams came roaring back on one patch of sediment where none had grown for 20 years: a midden where his crew regularly dumped their culled shells. Likewise, foragers have long known they should toss back the shells of the wild oysters they take, so new oysters can set on them. Steamer clams are the only shellfish that can be harvested for consumption in Boston Harbor. Once harvested they are sent to a plant to live in clean water until harmful bacteria have been cleansed from their system. Green suspected that the discards also provided another benefit. Shells are composed of calcium carbonate, the main ingredient in Tums and Rolaids. Perhaps the discarded shells were buffering the sediments, making them less acidic? He tested this hypothesis in the lab, using different forms of calcium carbonate. Whole shells and marble chips didn’t work as well as shells ground to a fine grit: "We’ve gone through dozens of coffee grinders," he says with a laugh. And gotten encouraging results. Now, with a new grant from the National Science Foundation (which has given $1.2 million to his research over the course of a decade), Green is testing the approach at full scale in Broad Cove. He has also put his money where his research is. He points to a small island out beyond the cove. "After growing clams in the lab, I realized I like rearing these little guys. So I got an oyster farm out there." Green’s efforts to fend off acidification in sediments along the shoreline won’t stop sea life from crashing due to a worldwide increase in CO2; only a drastic reduction in carbon emissions can do that. But it might enable growers like him to keep providing us with delicious clams and oysters for a few more decades -- if only to remind us of what we’ll miss when they’re gone. Traveling Raw Bar Can Come to You. A friend of MOP forwarded me word of this new enterprise and we thought it warranted sharing. The R.Shucks Travelin’ Raw Bar is a veritable seafood restaurant on wheels, taking reservations now for your next dinner party, poolside cook out or nautical event. You can contact Thomas and he’ll source an array of fresh seafood—everything from littlenecks, hard clams, shrimp and up to three kinds of oysters. Then, he’ll make the pilgrimage up from the Cape with raw bar in tow, set up in about 45 minutes and start shucking and serving. He also willing to bring his 800-pound ice maker powered by a five-kilowatt generator. Which tends to come in handy when you’ve got throngs of people ravaging your home bar and need the ice to back up all the cocktails.